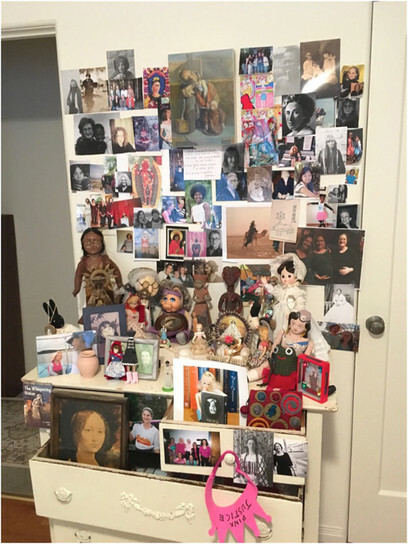 For a few days before going to the protest, I gathered images of women and girls and arranged them in a group: ancestors, dolls, figures, goddesses, paintings, the living and the dead, some with whom I had been communing. Some are hidden in veils and masks and voodoo. Some are brides or in braids or shy or bold. 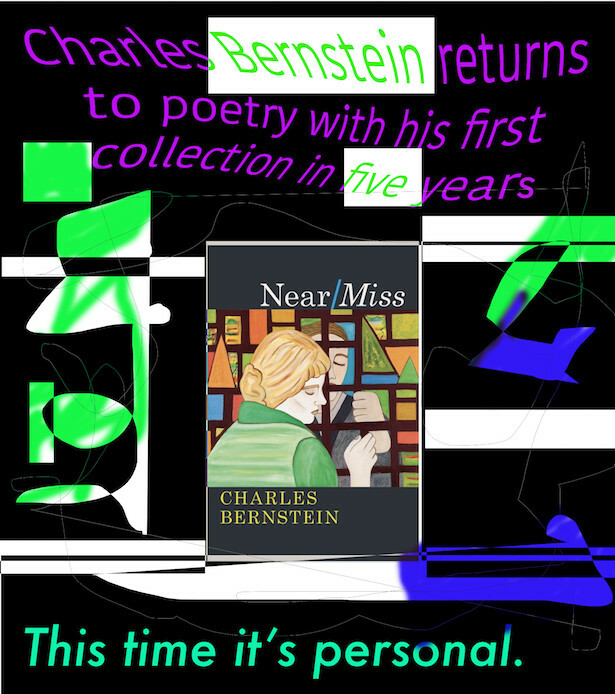 Daughters, stepdaughters, daughters-in-law, mother, mothers, aunts, grandmothers, great greats, sisters-in-law, relatives in hiding. C. D.
for the dead to pass. “I am wont to join the collective that has the miracle and privilege of flowering. 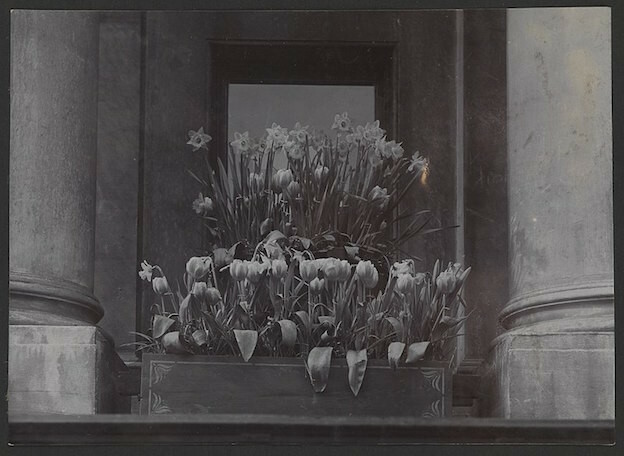 The unblooming, then, is the motion I sit with — this lag time that goes on.” Photo by Reginald A. Malby and Co., Southwark Local History Archive and Library, via Wikimedia Commons. 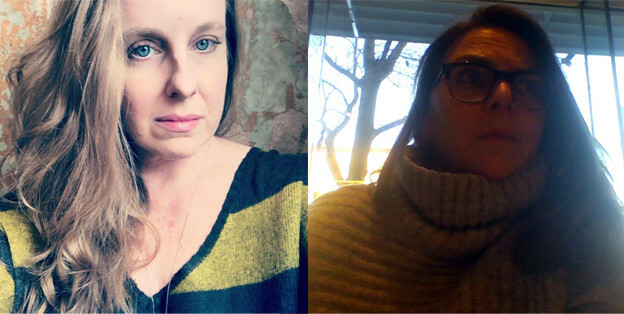 I sit with Solidarity Texts, and I am drawn to its states of motion: Anne Waldman’s metabolizing, M. NourbeSe Philip’s ruminating on what cannibalizes, Levi Bentley’s “Destroy them […] Keep moving,” everyone’s marching; and — yet — all the stall therein. What to make of ritual time, written and henceforth read; of the memorial, the eulogy, the flash obituary kept here. 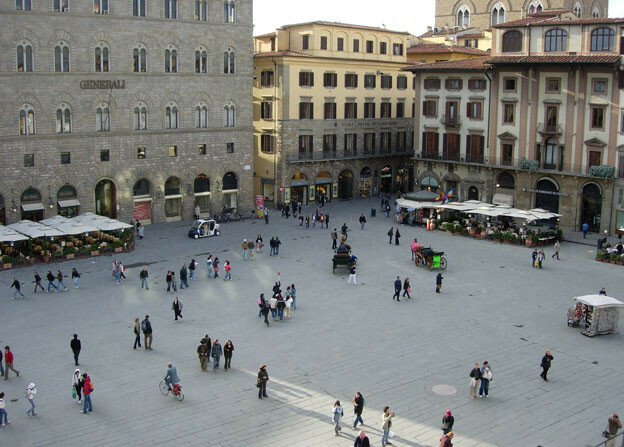 “Many knew that no matter what they did, if they moved through a public space, it would have to be deliberate, and their bodies would be read as a statement.” Above: image of a public square in Florence by Samuli Lintula, via Wikimedia Commons. Think back to the last time you marched — when you moved deliberately through a public space, when you used your body not just to get from one place to another but to be a statement, when you had to be keenly aware of the larger body you moved within and the body you moved against. If you’ve never marched before, go out now and try it. Now think back. Begin again. Think back to the last time you marched — when you moved deliberately through a public space, when you used your body not just to get from one place to another but to be a statement, when you had to be keenly aware of the larger body you moved within and the body you moved against. If you’ve never marched before, go out now and try it. Now think back. 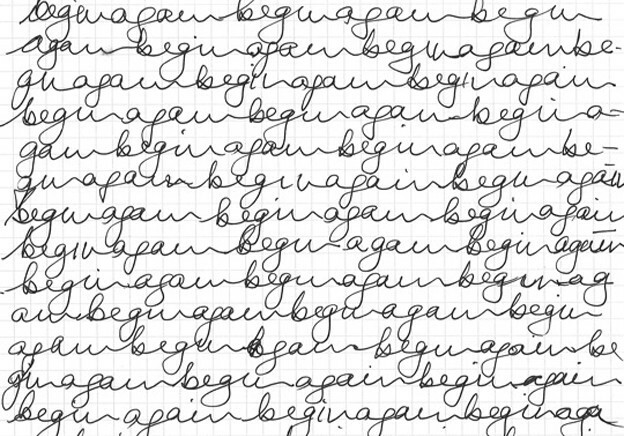 Begin again. Be aware of your body in this public space. Are you cold? Are you hungry? Do you carry a sign? Is it heavy? Does it block the view of the people behind you? Are you walking? 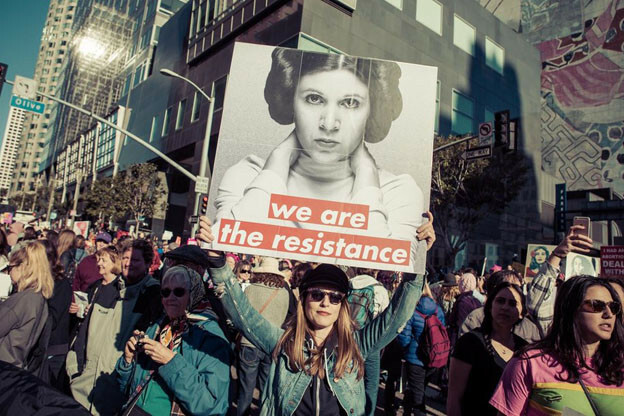 “One marcher from Chicago, Cheryl Thomas-Porter, summed up the communitarian, participatory, and engaged nature of the march in an interview with CNN: ‘This march is us. We made this march. 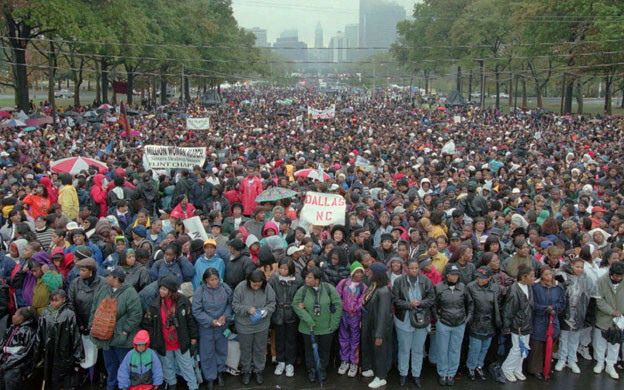 … The march is the contribution of every single woman of African descent.’” Above: marchers gathered on the Benjamin Franklin Parkway on October 25, 1997, for the Million Woman March in Philadelphia. “The voice of the poem transposes Kruger’s feminist dissent to the context of Trump’s inauguration; the President becomes Kruger’s boy-child clenching his fist to flex his bicep, an unnecessary ‘hero.’” Above: Vanessa Witter at the 2017 Women’s March in LA, holding a sign in the style of Barbara Kruger’s protest art. Photo by Scott Witter. On April 9, 1989, over four hundred thousand women marched on Washington in the March for Women’s Lives. Barbara Kruger’s Untitled (Your body is a battleground) (1989) is perhaps the most lasting image from the protest. Kruger divides a photograph of a woman vertically, half in black and white, half in negative, light and dark reversed; an aesthetic of conflict. On April 9, 1989, over four hundred thousand women marched on Washington in the March for Women’s Lives. Barbara Kruger’s Untitled (Your body is a battleground) (1989) is perhaps the most lasting image from the protest. Kruger divides a photograph of a woman vertically, half in black and white, half in negative, light and dark reversed; an aesthetic of conflict. It is a work made directly for the purpose of protesting for liberation from legislation that prohibited women’s reproductive freedom. 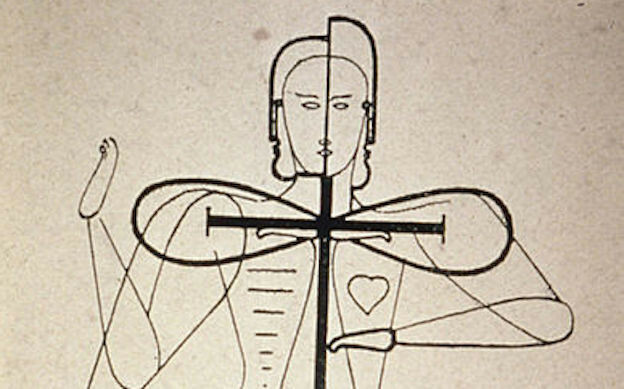 “The ‘dance feministic,’ as the song calls it, is a defiantly happy shimmy and thrust and a lipsticked grin that won’t give itself away.” Image from sketch of figural movement for dance (1921), Oskar Schlemmer, via Wikimedia Commons. We are drawn together to march but because we are so many, we cannot march. 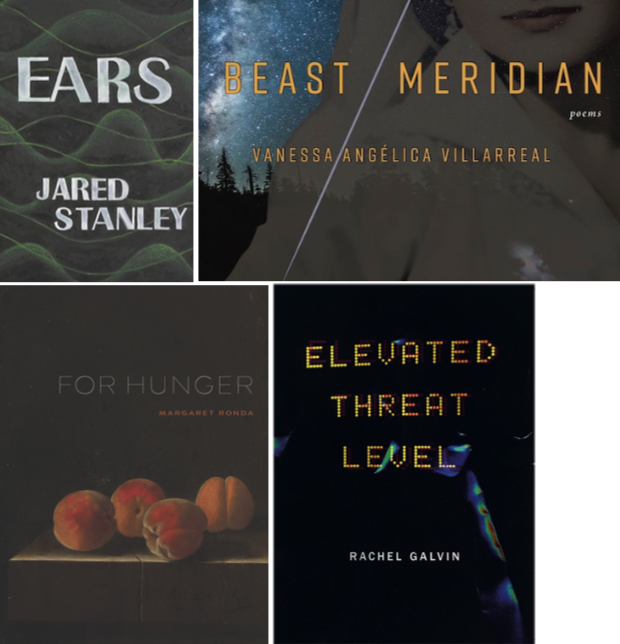 We can only shuffle off balance, lean, wind our way, press or fall against one another, allow ourselves to be moved, give up our bodies to the swarm. And so we find we are not militant but in motion, a motion we can’t master.